Coulter Collision Center is a full-service automotive collision repair center, repairing all makes and models of vehicles, and working with all insurance companies. Founded in 1923 by W.C. Coulter, we’re known for offering the finest in quality and convenience. Our company has an A+ rating with the Better Business Bureau. We provide free pick-up and delivery service from your location in the Phoenix area, as well as from all Coulter locations (Coulter Infiniti/Superstition Springs, Coulter Nissan/Surprise, Coulter Cadillac Buick GMC/Tempe). Coulter Collision Center offers convenient hours and 24-hour roadside assistance, along with a lifetime warranty on all labor, parts, and paint. Our technicians specialize in great service and workmanship in our 100,000 square foot shop. Our customer lounge, with food service, is open six days a week. At Coulter Collision Center, we believe in high quality repairs, exceptional customer service, honesty, safety, and integrity. Choosing the right shop for your needs is important. Please visit our convenient location at 12th Street and Camelback, and see for yourself why our customers are satisfied. We hope to be your choice for years to come. Coulter doesn’t just do repairs. They painted Super Snake stripes on my Mustang. Mark endured my color choice search with the patience of Job and the finished product is outstanding. I cannot thank Mark enough for the fantastic customer service! My whole experience has been great and they will be my body shop for future repairs. Jill is the sweetest receptionist! You are going to love your experience here! I received exceptional service throughout the consultation, repair, and delivery of my vehicle. The work performed on my Acura was a fairly difficult blend of paint in the left rear quarter panel and they achieved near perfection. Many thanks to Carmen, Mark, and the rest of the staff. Excellent service, excellent body work with a warranty, and excellent service person. Mark is knowledgeable, experienced, and personable. I will recommend this shop to my friends and family. Coulter Collision did a great job repairing our car after an accident. It was ready when promised and I was given daily updates by text and email as to the progress. Everything went very smoothly and I would definitely use Coulter Collision again if I needed to. Thank you Coulter Collision, for the awesome job you did on my car. You a great job! Even made sure my car was cleaned out nicely, after the rain from the monsoon destroyed it. I am very happy from my experience, I will always bring my car here! I can’t say enough about Coulter Collision! I brought my car in for an estimate on some minor scratches. The estimate was very reasonable and Mark was such pleasure to work with. I brought the parts in to get painted, then came back the next day to have them installed. It literally took 15 minutes if even that. Mark conveniently made an appointment with the service department to have my oil changed, since I was there already. Not only did they take care of these services, they also rotated my tires and washed my car. I highly recommend this shop for its honesty and dedication to their customers. Coulter’s quality of work is excellent! I received courteous, expedient, and excellent service on repair of my vehicle. They handled everything professionally from start to pick up of my vehicle. Thank you! Jay Santomeno made this as easy as it could possibly be. The professionalism is always beyond expectations. Every detail was taken care of plus a few special requests. This is my shop for as long as he is here. they really did a overall nice job of repairing our vehehicle. Hope we never have to use them again but if we do, we’ll go back. Great experience from the estimate to the final repair. Car looks like I just bought it. Calls were returned immediately if not answered when I called. Thanks to Samantha and Riley great customer service. When I was rear ended in my Red Cadillac XTS I would only trust Coulter Cadillac with the repairs! Coulter Cadillac made contact with the responsible insurance Co and made all arraignments for the needed repairs. Colter offered to pick up my car and provide a loaner car. The repair was promptly made with their specified time with no inconvenience to me. My Cadillac came back looking like I had taken delivery off the showroom floor. I bought my cadillac from Coulter and saved over $7000.00 below the price I was given from a different cadillac dealership. Coulter has serviced my vehicles since their dealership was in down town Phoenix over 50 years ago. Thank you to the entire Coulter Team! Small damage to my bumper and cracked tail light. I knew I wanted to insure car was properly repaired as well as carefully examined for any additional damage that was not clearly identified. These guys took their time and did the job right. I would not have trusted my car to anyone else. Excellent work. I had my Infiniti G35 repaired at Coulter Collision and they did a great job! The entire right side of my car was replaced and repainted. The work was completed in a reasonable amount of time and everything looks brand new. I highly recommend! The staff at Coulter Collision Center were very helpful and professional. They remembered my name when I came in, were on time when I needed the paint job done, and my pickup truck looks beautiful! Impeccable customer service! My car looks good and they kept me informed all the way. Thanks to all the staff but a shout out to Sam, Riley and Steve S.
Coulter Collision Center did an excellent job in a very timely manner. I highly recommend this to everyone. Amazing service! Attentive, efficient, and timely. Explanations were thorough. Excellent customer service… friendly, courteous, caring and responsive. 2 days in and out including front fender paint!! Who ever heard of such a thing? Head lights, front fender, bumper, bumper facia(cover), tear down, replace and paint. What a team and an unbeatable attitude. Simply the best. Thanks Jay and Issac. Riley always answered my questions and kept me posted. My car looks great. Thank you. Recently my wife was in an accident and thankfully she was alright, however, our vehicle wasn’t. We have Geico for our vehicle insurance (not the best I understand, but the price is affordable.) After the accident Geico had the vehicle moved to Service King Collision Repair which happens to be their preferred “express service” shop. Obviously I had concerns that some sort of collusion was afoot. Unfortunately my concerns were warranted as I was given a ridiculously low estimate for repair that couldn’t possibly fully repair all the damage properly to my vehicle. My concerns were A)the diminished value to my vehicle, B)If the vehicle would ever be without problems after repair, C)the quality of workmanship. Now, myself not being a mechanic, I did a little research and decided after a phone conversation with Jay at Coulter Collision Center to have them look at my vehicle. The vehicle was transported and Jay worked with the adjuster on our vehicle. Wow… Did I make the right choice! Jay kept my best interest as the customer in mind and was able to protect my personal assets beyond what I thought was possible. The auto business is full of shady characters from buying a vehicle to repairing one, but, have no concerns in working with Jay at Coulter Collision Center. The guy is top notch at what he does and I will always recommend them to anyone I know! A great experience. Very knowledgeable and courteous employees. Top notch repair and attention to detail. I would highly recommend Coulter Collision Center and their great staff. Extremely pleased with the work. Very well treated by everyone. Will recommend Coulter Collision Center. My experience with Coulter Collison has been top notch. The work, the customer treatment, the finished product has always been to the highest standards. Jay, the estimator, was very curteous and very helpful. I would recommend Coulter and Jay for any type of work you need on your vehicle. They go out of their way to make sure your experience is great. After getting into an accident on the freeway, I was worried that my car was never going to drive or look the same again. I chose Coulter Collision Center to repair my vehicle because I have heard good things about their technicians and management from my coworkers. I could not be happier with the excellent customer service that I received and my car looks and drives great. Thank you to everyone at Coulter Collision Center for a job well done. I have had an amazing experience at coulter Cadillac I bought my car here and they made it so easy and I had a lot of good people helping me, I have been coming here to get my car serviced and it is always a pleasure!!!! I want to thank Jay and his team at Coulter Cadillac for getting my car back to original condition after someone tried to break into it. Their team was professional, courteous, and fulfilled all of my requests. Patrick the manager made sure that the work was done correctly and on time. Thanks again!! Patrick the manager was outstanding… Jay service adviser was outstanding… Great service , car finished when stated to be done. Car wash included. Jay, Patrick, Seth and Bridgett all did a great job in staying in touch with me regarding the repairs on my vehicle. They went above and beyond the call of duty. I have my baby back and she looks perfect. Thank you guys. Seth Greenwood, Patrick Sullivan, and Jay Santomeno’s teamwork in fixing my car made it look and feel brand new. Everything about the car is better than when I got it and the detail was amazing. Thank for your searching for auto body service in Phoenix, AZ, and Tucson, AZ, areas. We are pleased you've chosen GarageFly to help you with your automotive repair needs. Coulter Collision – Fix Auto Phoenix is one of GarageFly's many user rated and reviewed auto repair shops in the Phoenix, AZ, and Tucson, AZ, areas. There are so many choices for automobile repair in Arizona; we feel it's important for you to be well informed. 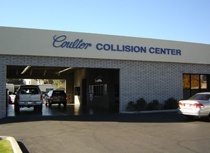 Please visit http://www.coultercollision.com/ for more information about this automobile repair shop's services.